WHEELING — Bryan Morseman loves to run. He wouldn’t enter so many marathons and half marathons if he didn’t. But more than his love of running is the love of his young son, Leeim. Leeim was born with spina bifida, a birth defect where there is incomplete closing of the backbone and membranes around the spinal cord. It is Leeim and the rest of his family that keeps Morseman going when those races get tough. 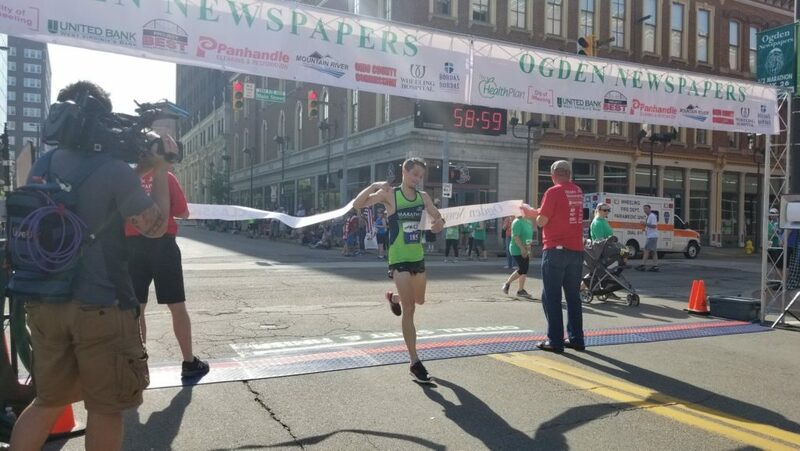 Saturday at the Ogden Newspapers Half Marathon Classic, they were there to cheer him on as he crossed the finish line with a time of 1:14:01.5 to win the annual race in his first attempt. “It was something last minute,” Morseman said of entering the race. “I was going to do the Buffalo Marathon (Sunday) and I decided not to. I wanted to do something a bit shorter and this was only five hours from home. We are used to driving 15-16 hours to a race. “My 3-year-old son was born with spina bifida and a good percentage of my race earnings go toward helping pay his medical bills, the travel for all his appointments. He is an inspiration. He will never be able to run in his life. He will have a hard time walking. It is tough but when I think about him, it makes those hills out there seem like nothing. The 32-year-old Bath, N.Y., native has run races in Charleston and Morgantown, but never entered the Ogden Newspapers Half Marathon Classic. It was a race he admired from afar before finally deciding to test himself in one of the country’s toughest races. “There is a lot of history here at this race and I know this course is tough. It fit me as a runner,” Morseman said. “I am more of a strength runner than a speed runner so I wanted to test myself here. I even shocked myself doing it as fast as I did. He finished almost four minutes before the runnerup, Christian Parker of Harrison, Ky., (1:18:26.0). St. Clairsville’s Kyle Timko was the first local finisher, coming in third with a time of 1:21:39.4. Morseman jumped out to an early lead and never looked back. “The competitor in me, I always challenge myself no matter the course,” Morseman said. “I gave it 110 percent out there. That was basically as fast as I could go. That course is a challenge and it feels more like you ran a marathon than a half marathon. “Those downhills are after those uphills, you think maybe you can coast. No way. Your legs are just totally spent and it takes halfway down the downhill section to get the them going again and by the time you get going again, you are going back up another hill.